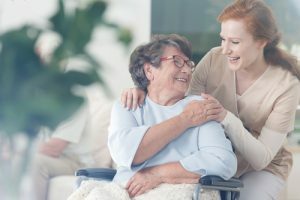 Patient empowerment through patient education is an all-important topic in the news and among healthcare providers and their patients. 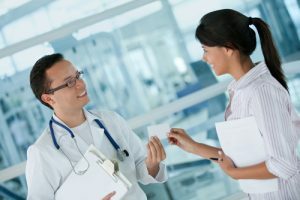 There are specific patient education departments in most major medical centers. What role do they play and how have they evolved over the years? I spoke with Louise Villejo, Executive Director at the Patient Education Office at the MD Anderson Cancer Center to get her thoughts on the topic. Louise has a strong background in healthcare, having received a bachelor of science in psychology from the University of Houston and a Masters of Public Health from The University of Texas, School of Public Health, in San Antonio. 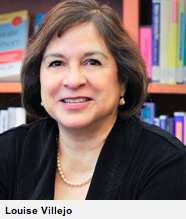 She has been leading the Patient Education Office at MD Anderson for over 30 years. The MD Anderson Cancer Center opened the Patient Education Office in 1979 with the support of the President of MD Anderson, the Vice President of Patient Care and the Director of Nursing. It started out as, and has continued to perform as an interdisciplinary department with many diverse activities. There is an extensive online site with many, many resources including research information, information on clinical trials, in-house class schedules, video libraries, patient support information and much more. Louise explained that besides the online resources, there are learning centers (much like libraries) where patients or family members can go and get help from librarians and health educators to help them research a specific disease or treatment, or get help with information about clinical research, clinical trials, managing side effects or coping. Patients can also email questions to the “Ask MD Anderson” feature on the website. Or they can access information on a more personal level through the myMDAnderson patient portal. There is also a wealth of printed information including fliers or brochures for those patients who prefer printed materials. When I asked which resource was the most used, Louise gave me some statistics. There are about 30,000 visitors to the Learning Centers on an annual basis. There are about 235,000 printed materials distributed annually. And there are about 925,000 visits to the online patient education resources annually. And the online resources have seen an increase in visits of about 25% over last year. Louise was careful to mention that the Patient Education Office wants to stay extremely tuned in as to what patients want. The office is continually asking and polling patients to make sure their needs are met. “Our program is built on ‘What do patients and family members need?’ From the beginning of the development of this program, we have been reaching out to patients and family members to do needs assessments, work with them on concepts, have them evaluate materials, do focus groups. That’s the core of what we do”. The Patient Education Office offers a variety of information and resources to try and fit all patients’ needs. They offer computer use tutorials for patients and families and the Learning Center’s help as much research as the patient wants. 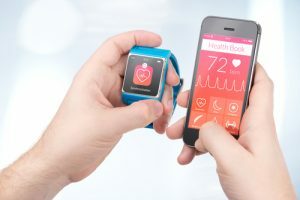 They do encourage patients to use social media and patient support sites and try and help patients sort out reliable sources from sources that are not so reliable. 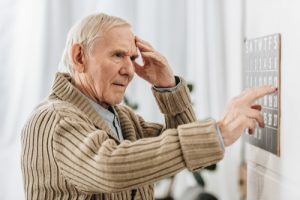 They do not want to leave any patient out and make sure that they are reaching the patients who are not so Internet savvy with enough printed materials, videos and personal guidance so that they also can learn about their illness and how to cope with their disease. I asked Louise if there was any one specific request of patients that she could comment on. I asked Louise about training the medical staff on patient/doctor communication and she told me about the program I*CARE that MD Anderson offers to its entire faculty. I*CARE offers CME and RME credit courses on patient/doctor communication. 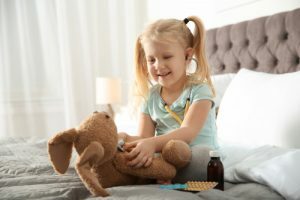 They have videos, online resources, workshops and lecture series on the topic of improving communication between patients, their families and the clinical team. I then asked Louise what she thought MD Anderson did best in the way of patient education and where she thought they could do better. 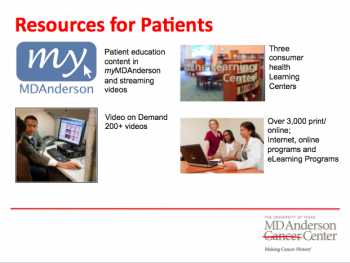 “The Patient Education Office at MD Anderson is a comprehensive program. We work with interdisciplinary staff in all the clinical areas to develop educational programs for their patients. We not only develop treatment programs but also have programs on prevention and diagnosis. We have an extensive survivorship program and also offer information on advance care and end of life decisions. We involve everyone and every aspect of patient care. 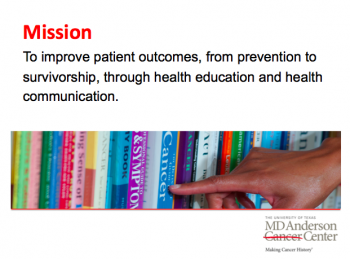 Education is an important part of MD Anderson’s mission and all staff are involved. Louise had seen patient education evolve greatly in her 30 years at MD Anderson and I asked her what she thought the near future would bring in the way of change. Thank you, Louise, for some great insights into patient education at MD Anderson!